It must be said that us England Dwellers are proud of our bins. Ask anyone from anywhere else in the world to put a plastic bottle in the bin and they will stand in front of the three different coloured receptacles confused like it was a game of scrabble… but you can only use Latin words. It’s Cocktail of the month time! This month those drink modification experts (mixologists) have concocted a brand new trashy tipple that uses something we all see every day, and transformed it into something desirable. To start, only the best will do for our people, and that’s why we’ve used the luxurious CÎROC Vodka as our choice in ultra premium spirits, as the crisp taste goes perfectly with our mix of banana liquor and cherry brandy, Topped off with a splash of ice cold cola. 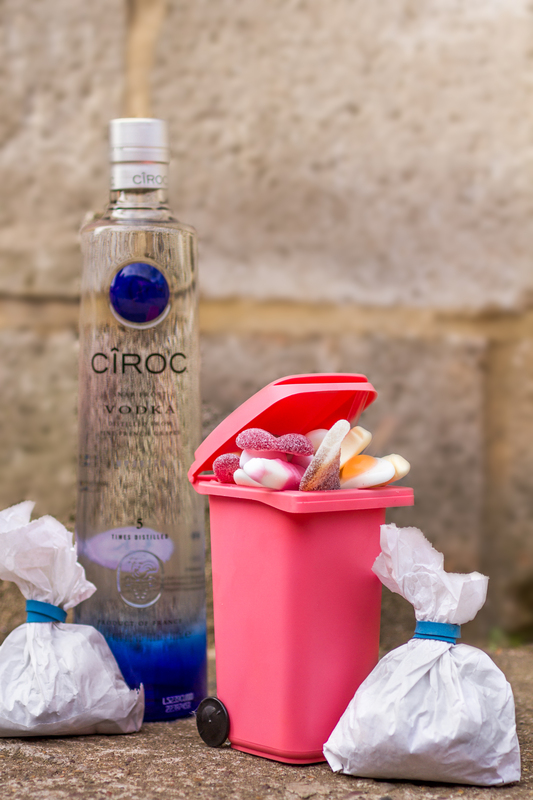 But our tantalizingly tasty cocktail doesn’t stop there, it is finished with a whole heap of toothsome sweets just tipped into the top of the bin of joy. So for plastics use the blue bin, for the best beverages in town, try something that’s not a load of rubbish, try the Dial.